The 333 Collins Street complex was completed in 1990 but within this complex stands a building that was constructed almost 100 years before, during the land boom of the 1890's. When entering the portico, the fully restored octagonal Domed Banking Chamber is breathtaking. The barrel vaulted ceiling, the granite columns and arches and the elaborate massive wrought iron gates have been restored to their original grandeur. The focal point of this venue is a gift from the past. The Dome is considered one of the finest venues in Australia. The historic atmosphere is the perfect location to celebrate and has been the majestic home of wedding ceremonies, wedding functions, cocktail functions, presentation dinners and the most special of occasions. This image belongs to the travel and nature stock photo library. This stock photo of 333 Collins Street Interior #2 is available for licensing for commercial and editorial uses including websites, blogs, books, magazines, brochures and advertising. Restrictions may apply for images which contain third party copyrighted material or sensitive subjects. Photos of artwork are for editorial use only. 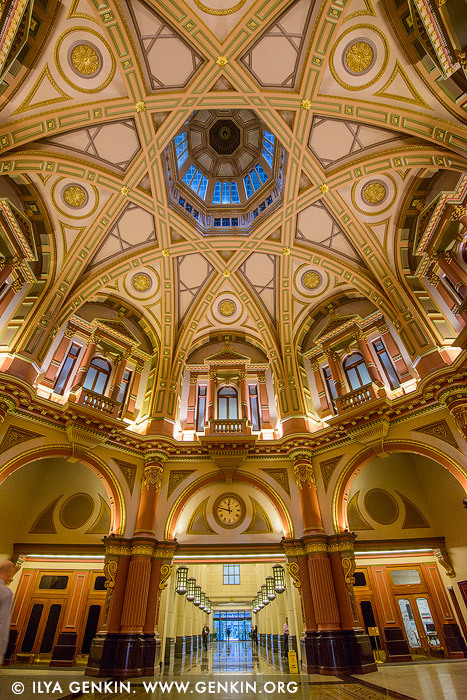 This image id AU-MELBOURNE-0099 of 333 Collins Street Interior #2, is copyrighted © by Ilya Genkin. This is not a public domain image.